Your roof is one of the most important components on your entire home. Not only does it give you a solid barrier over your head to protect you from the rain and elements, but it also forms a key component in how well your home is insulated from outside temperatures. In addition to the functional aspects of your roof, it also plays a major role in the exterior aesthetics of your home. Your roof helps to define the overall look and enhances the curb appeal of your home as long as it is in good condition. A dingy or worn looking roof can easily make the rest of your home look the same, no matter how well-kept or maintained it actually is. 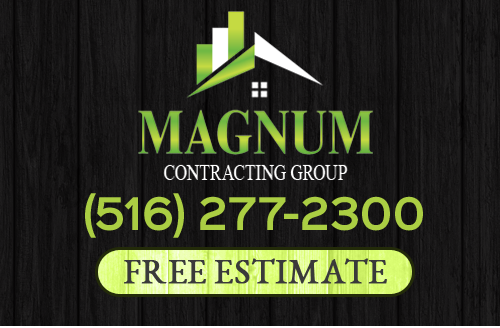 Our team of professional Great Neck roofing contractors here at Magnum Contracting Group can help you make sure that you are getting the most from your roof both in terms of function and form. We consider it a great honor that so many local customers trust us to handle all of their roofing needs. We understand the significant investment your home is to you, and you can always rest assured that when you hire us for your service, you are hiring a team of professionals who will treat your home with the respect it deserves, and will never leave a job half finished. We stand behind the quality of our work 100%, whether we are installing, repairing, inspecting, or replacing your roof, you can be guaranteed that you are getting the same level of quality in whatever work you are hiring us for. We make it our goal to maximize the long-term value to your home in every job we perform. If you are looking for a professional roofing service for your Great Neck home, call the team of experts at Magnum Contracting Group today. Our polite and professional staff are always standing by and willing to answer any questions you may have about our services or just roofing advice in general. Call us today to schedule your appointment. Whether we have installed a brand new roof for you or just replaced your old one, our team of professional Great Neck roofing contractors will be available to help you with all of your roofing maintenance needs throughout its lifespan. Everything from monitoring its condition regularly, to giving it the proper maintenance it needs to keep performing its task are all tasks we would love to help with. In the event that your new roof suffers unexpected severe damage from a storm or something similar, you can always count on us helping you get things back to normal. If you are looking for a professional Great Neck roofing contractor, give us a call today at 516-277-2300 or complete our online request form.